Hyundai managed to do the impossible – keep the launch of its 2013 Santa Fe Long Wheelbase model almost a complete secret before it was launched at the New York Auto Show. That's practically unheard of in this day and age. Frank Ahrens, Hyundai's director of global public relations in Seoul, had hinted the night before at a media dinner that there was a surprise coming. It probably had something to do with being up for 44 straight hours but that's all he would say. The Santa Fe Long Wheelbase (or LWB for short) was almost presented as an afterthought by Hyundai Motors America president and CEO John Krafcik. 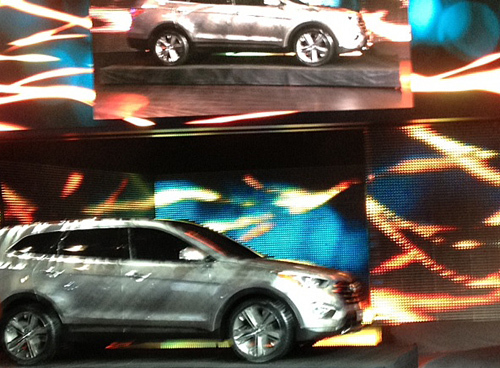 A lengthy presentation had been made on the 2013 Hyundai Santa Fe (details below) when Krafcik said, in effect, there was one more thing to show – and the wall moved back and out slid the new Santa Fe LWB. It's going to be a seven-passenger model with a 3.3-liter V6 producing 290 horsepower. Hyundai said it is the only gasoline direct injection V6 in a midsize crossover, which helps it achieve an estimated 19-mpg city and 26-mpg highway. Buyers of the short wheelbase Santa Fe, which seats five passengers, have a choice of two engines: a 2.4-liter Gasoline Direct Engine (GDI) engine or a turbocharged 2.0-liter GDI engine. Both engines have been well tested in the Hyundai Sonata a and have the ability to tow up to 3,500 pounds. With 190 horsepower and 181 lb-ft of torque (estimated), Santa Fe Sport 2.4 still manages fuel economy of 23 city and 33 highway (estimated). The higher output 2.0-liter turbocharged engine found under the hood of Santa Fe Sport 2.0T increases horsepower to 264 (estimated), while delivering fuel economy of 23-mpg city and 31-mpg highway. Both Santa Fe models have exciting available technology. Buyers will have the opportunity to opt for the intelligent active All-Wheel-Drive (AWD) system and TVCC, which cooperatively controls torque and braking in conjunction with the Vehicle Stability Management System. This system can anticipate traction requirements and deliver additional stability through braking via continuous monitoring of driving conditions compared with other AWD systems, which can only react to conditions after they occur. As Hyundai explained, "All AWD Santa Fes access an intelligent control unit that continuously analyzes data from the vehicle controller, and through a multi-clutch plate distributes torque to any single wheel at a time. The coupling system is fully controllable via an electro-hydraulic actuation system. Braking force can also be sent to any single wheel at a time via the software. These processes are known as torque vectoring and torque braking. All this analysis is completely transparent to the driver." Also, behind the wheel, drivers will be able to choose among Hyundai’s all-new Driver Selectable Steering Mode, with three operating modes: comfort, normal and sport. This system allows drivers to adapt Santa Fe Sport and LWB Santa Fe’s steering characteristics to varying driving preferences and road conditions. Comfort mode is ideal for city and parking environments, offering the greatest ease of steering with a 10 percent decrease in steering effort from Normal mode. Normal mode is ideal for a mix of driving conditions. Meanwhile, Sport Mode is optimized for higher-speed freeways or winding roads and increases steering effort by 10 percent from Normal mode. The Driver Selectable Steering Mode not only adjusts power assistance levels in each mode, but also adjusts on-center build-up feel and steering build-up curves throughout the steering range, for a very natural and progressive feel. Not that many years ago, the media would have only showed up to a Hyundai press event eagerly seeking the free lunch being served afterwards. (Never get caught between an auto journalist and a free lunch – it's a dangerous place.) Now, Hyundai is actually serving up news at its news conferences. The short wheelbase version with the turbo getting 31mpg is a big deal. There will be nothing comparable in the market.